Alexander Morozov, now a researcher at the University of Edinburgh, has been a participant of the 5th IYPT (1992), 6th IYPT (1993), and several national and regional tournaments in 1991, 1992, and 1993 on behalf of Odessa and Ukraine. In 1993, his team was a silver winner at the 6th IYPT, held in Protvino, Russia. Alexander analyzes the long-term educational influence of the Tournament and clarifies many organizational details of early IYPTs. I.M. When did you first take part in a Young Physicists’ Tournament? A.M. It was in 1991, if I am not mistaken, when Evgeny Yunosov held an important large nationwide Young Physicists’ Tournament in Odessa. I am not absolutely sure, but seemingly it was the Soviet YPT. For the first time, I became a YPT player at this 1991 competition. The team of my school, the Richelieu Lyceum, took part in the Soviet Tournament in Moscow a year before, in 1990, but I did not play at that time. I.M. Where exactly this assumingly ‘All-Soviet’ YPT was held? A.M.It was held in the Pioneers’ Camp ‘Molodaya Gvardiya’ (Young Guard) just at the coast of Black Sea. I.M. What were the achievements of your team at the ‘Soviet’ Tournament of 1991? A.M.We reached the Finals, but ended at the third position in the Final Fight. Besides me, the team included Valentin Topelkin and Igor Zozulya. There were teams of Zaporozhye and, probably, SUNC MGU at these Finals. The decision to launch the All-Ukrainian Young Physicists’ Tournament was taken after this Soviet-wide competition. In 1992-1993, the Ukrainian YPT was held in Odessa. I.M. Did your team take part in the 4th International Young Physicists’ Tournament in 1991? A.M. No, we did not go there. I.M. In what Tournaments of 1992 did you participate? A.M. Well, at least in the large All-Soviet Young Physicists’ Tounament and in the International Tournament in Protvino. I.M. The Soviet Union was no longer existent in 1992. It seems strange that such a competition was called a ‘Soviet’ Young Physicists’ Tournament. A.M. I am not certain, but it seems to be that it bore that name . I.M. Where did the 1992 ‘Soviet’ Tournament take place? A.M. After a certain amount of efforts, I recall that this place was called Lesnaya Polyana. It was quite a lonely place outside Moscow. I.M. 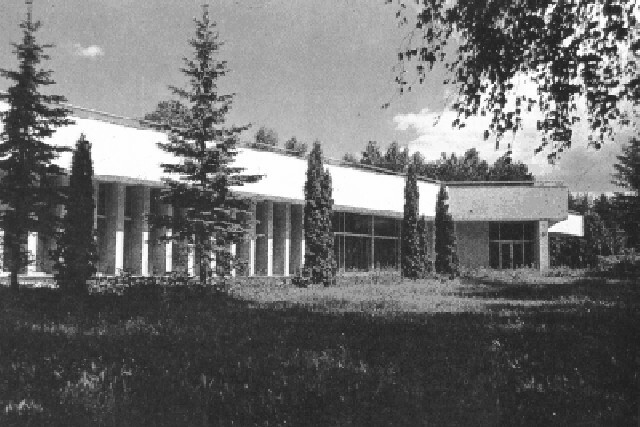 After searching for a while, I may assume that this place was the Lesnye Polyany resort facility (les-polyani.ru). Does it seem correct? I.M. What were your achievements at this competition? A.M. We reached finals and approached the absolute winners with a very narrow margin. There were discussions if to grant us with a shared first place, or with a second place. We were awarded with the shared first position, in the end. I.M. What problem did your team report at the Finals of the ‘Soviet’ Tournament of 1992? A.M. It was a problem about the water flowing through a dam. Igor Zozulya was the reporter. By the way, exactly as it was in 1991, our team included me, Igor Zozulya and Valentin Topelkin. I.M. You were a participant at the 5th IYPT, where the teams of Belarus and Czechoslovakia were reported to be gold winners. Who were members of the Ukrainian national team at the 5th IYPT? A.M. There was a strange decision. The national Ukrainian team would consist of three persons from my team (namely, me, Igor Zozulya and Valentin Topelkin), and two persons from Zaporozhye (I cannot be quite sure that this is precisely correct.) It was due to the fact that my team represented Odessa, not the entire Ukraine. I cannot be sure if this decision was taken by Ukrainian authorities or by the organizers of the 5th IYPT. If I am not mistaken, Yunosov himself took part in the discussions. When we arrived to Protvino, it turned out that the second half of the team was not able to come. Therefore, only three of us played at the competition. Our team could not report several problems, because they were expected to be developed by the second half of our team. That is why we reached Semi-Finals, but did not pass farther. We were not among finalists, but I cannot remember our exact position. I.M. When did the 5th IYPT take place? There have been references that it took place on April 25-30, 1992. A.M. It was held in Summer 1992. It is absolutely impossible that it took place in April. I.M. Am I right that in 1993 you took part in a Ukrainian national competition before joining the Ukraine’s IYPT team? A.M. The team that I was tightly affiliated with ceased to exist in 1992, when everyone graduated from secondary school and entered university. I was a year younger than my team mates and could play in 1993. Therefore, I was a member of the team of Richelieu Lyceum (Odessa) that consisted of very young inexperienced students. We ended third at the All-Ukrainian Tournament, held in Odessa. The winners, another Odessa team, gained the right to participate at IYPT and invited me to join them. In result, I may say that the Ukraine was represented in Protvino with a team that won a selective tournament, plus me, who joined the national team without technically deserving that. I.M. How much time did your team spend in preparation to the 6th IYPT? A.M. We didn’t have much time for preparation. We worked for a month, or so. I.M. Who was the chief organizer of the IYPT in 1993? A.M. Evgeny Nikolayevich Yunosov was the principal organizer of the Tournament. I also recall a surname Varlamov. Seemingly, he was a Moscow team leader, but he was associated with the Organizing Committee. I.M. I may say that Sergei Varlamov was a prominent YPT activist in early 1990s. He brought the Russian team to the gold medals at the 7th IYPT in Groningen, Netherlands. After retiring from training Russian IYPT teams, he focused on the Physics Olympiad and, also, the Physicists’ Tournament for University Students which he now supports and promotes. Could you clarify where exactly the 6th IYPT was held? Where did the participants live? A.M. The Tournament was held in Protvino. The teams lived in a hotel, which was a rather high 10- or 12-storey building located on the main street. In 1992, everyone lived in exactly the same hotel. I.M. 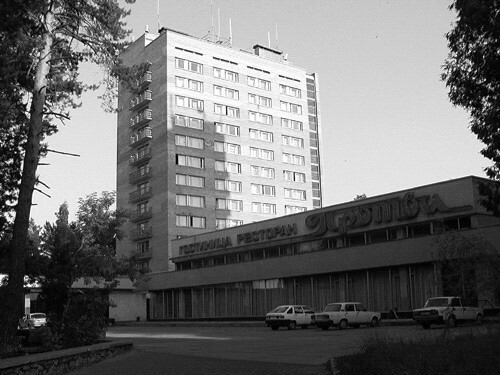 After some searches, I may say that it must have been Protva Hotel (protva-hotel.podmoskovie.info). It is a 12-storey building, located on 4, Ulitsa Pobedy in Protvino, Moskovskaya Oblast. Ulitsa Pobedy (Victory Street) is the central street in Protvino. Where did the Opening and Closing ceremonies and also the Physics Fights take place? Did they take place at the Protvino-based Institute for High Energy Physics? A.M. The Physics Fights were held at a Conference Center, on the same street, in some 500…700 meters from the hotel. An observation station for the accelerator was located just there, near the center of Protvino. I.M. 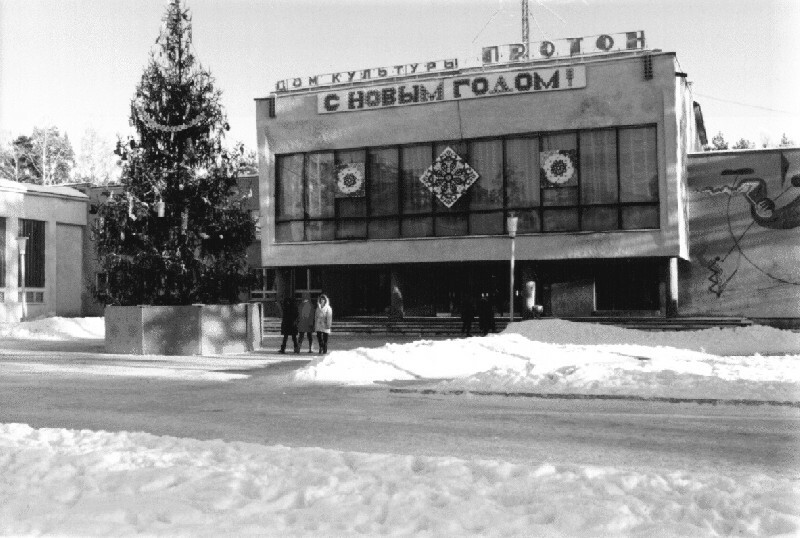 After further searches, I may assume that this Conference Hall was inside the ‘Proton House of Culture’, located just there, on Ulitsa Pobedy. It might possibly have been the House of Scientists, located near Moskovskaya Ulitsa. I.M. What teams took part at the 6th International Young Physicists’ Tournament in 1993? There have been references to the teams of Belarus, Czech Republic, Georgia, Hungary, Moldavia, Netherlands, Poland, Russia, Slovakia, Ukraine and Uzbekistan. A.M. Well, the team of Ukraine was my team . There was no other Ukrainian team. I clearly remember the teams of Belarus, Czech Republic, Georgia, Hungary, Netherlands, Russia and Slovakia. I cannot definitely confirm the participation of other teams. I.M. There have been indications that, all in all, 19 teams from 11 countries took part at the 6th IYPT. If confirmed, it would be a unique case in the entire IYPT history, meaning that one or several nations were likely to be represented with much more than 1 or 2 teams. There are concerns on the validity of these reports. A.M. I vaguely recall Selective Fights where the teams were distributed in a ’strange’ (non-uniform) way. Theoretically, the number of 19 may be correct. I.M. Was it a common practice of making reports with paper posters? Were there any teams that used transparencies and overhead projectors? A.M. Usually, the reports at the All-Soviet and All-Ukrainian tournaments were made with paper posters. At the International Tournament, almost everyone used transparencies. It was considered a ‘gesture of desperation’ if someone wrote with a chalk on blackboard. In 1993, the team of Netherlands brought a laptop with PowerPoint presentations. I am very doubtful of how they showed it. If I am not mistaken there might have been a technique of projecting the slides with a common overhear projector. Unfortunately I don’t remember that clearly, but it is even possible that they had a laptop with a transparent LCD panel that allowed projection to the screen when placed on the overhead. I.M. Did the Russian remain the most used working language at the 6th IYPT? A.M. Yes, almost every team spoke Russian at the Physics Fights. It was the working language of the Finals as well. I.M. How was organized the interpretation for the Dutch team? Did the Organizing Committee supply interpreters? A.M. Well, yes, the interpreters were available. However, they were senior university students or young researchers who have just passed their exam in English language. Unfortunately, it didn’t assist them to interpret complicated speech in real time. It was quite often that a certain juror assisted such an interpreter of even replaced him. Once, I personally interpreted the Dutch report at a Physics Fight when we played together. It was humorous . I.M. Was there any interpretation for the Dutch team during the Finals? A.M. I cannot say that for sure. I.M. The ranking tables after the 6th IYPT are quite obscure. Can you recall the achievements of any teams? I.M. What problems were discussed in the Final Fight? A.M. I must say that at certain Tournaments of early 1990s, the Finals were held with absolutely new problems distributed in a day before the Final Fight. However, it was not a practice for IYPTs. I did not make a single report at the Tournament of 1993, because no one challenged our team with ‘my’ problems. In the Final, we won a preliminary fight that allowed us choosing the sequence of stages. We announced that we would like to make report in the last stage. We had a prominently developed solution to the problem “Gagarin’s Record” that I was expected to present. After certain tactical manipulations, the team of Georgia could challenge us with either the problem “Gagarin’s Record” either the problem “Capacitor/s” that we had already reported in the Selective Fights. Unfortunately , the Georgian team made an absolutely reasonable decision of not challenging us with “Gagarin’s Record”. So, we reported a problem on Capacitor/s and the Georgian team opposed us. The Georgian team reported the problem “Dominoes” which proposed to study the propagation of a wave in the line of falling domino bones. I.M. Who was your team leader and could you recall the names of your team mates? A.M. My team leader was Sergei Kolos. The captain of my team was Roman Stepanyan. Unfortunately, I cannot remember the names of other team mates, because I met them in the very last moment before the IYPT. As I have said, I was invited to join a team that I was not affiliated with before. I.M. A number of problems at today’s tournaments are focused on the soft condensed matter physics, which is of common interest for you and me. There are many topics concerning polymer physics and physics of complex fluids (such as the rheological behavior of shear-thinning fluids, Kaye effect, Weissenberg effect.) Colloid solutions, surfactants and various capillary instabilities appear in problems every year. Were there any problems of this type in early 1990s? I.M. Did the Tournament leave positive impressions on you? Do you think it provided you with certain skills necessary in life? A.M. Positive impressions? Definitely, yes. It was fascinating to travel to different cities, to communicate with people of the same age and the same interests, to compete etc. Skills in life? Probably, yes. But certainly not in science. Several years after I entered the university, I became more or less indifferent to Olympiads and Tournaments. In my opinion, the form of the Tournaments that I observed when being a player, contributed to developing skills that were not quite important in science, and were harmful sometimes. In many cases, it was required to quickly think and to present yourself in a bright form, but not to draw validated conclusions. Please, don’t get me wrong. If someone presented a solution with errors, these errors were immediately revealed. However, the background knowledge and substantial achievements of participants did not play as influential role, as certain irrelevant aspects did. It would be very interesting for me to trace the biographies of the participants of the Tournaments of 1991-1993, in which I participated. I would be eager to find out the percentage of participants that became involved into scientific activities, and how successful they are nowadays. It is possible to detect these things with the reference indexes for their publications (Web of Science). I assume that the result would be depressing. Among my immediate acquaintances, there were many persons whom I considered much more intelligent than me. None of them is associated with scientific activities today. I should notice that my partially negative perception of the Tournament is caused by nothing but this ‘distortion’, when the Tournament achievements failed to match the later scientific achievements of a certain person. This perception appeared much later. When I was a player myself, I was sincerely fascinated with every new Tournament and they constituted the brightest events of those years. I.M. I personally think that today’s YPT community apprehends your concerns very seriously, because it is of greatest importance to find a balance of competition (that motivates participants and is a cornerstone of any YPT) and highest scientific standards in very broad and nuanced sense. A.M. If one assumes so, I would agree that concept of YPT is a leap towards “thoughtful analysis and considerable immersion into the subject”. It is then very important that the grades for a given research project are adequate. Otherwise, we may eliminate all enthusiasm of participants, event the greatest. I.M. What was the atmosphere of the Tournaments of 1992 and 1993? A.M. It is difficult to formulate an answer. Everyone had a great will to win and therefore the relations between teams were quite troubled, and hostile in certain cases. Throughout the tournament, when many teams were not passing to consequent Rounds, the mood and the atmosphere were progressively increasing. But that was not the case for the finalists . I recall the experience of the International Young Physicists’ Tournament of 1992. Then, the Georgian team did not pass to a certain Round (possibly, before Semi-Finals) and offered us to take advantage of their operating prototype of a Magnetic Suspender. It was assembled for demonstrations for the problem “Magnetic Suspender”. However, they seriously competed with our team before. An element of competition was prevailing. Physics played a secondary role, unfortunately. I.M. How attentively did the Jury consider the novelty and originality of solutions? A.M. Well, my opinion is biased, by default . In my opinion, if there were no evident faults in the solution, the attention was mostly paid to the clearness of presentation. I still recall the impressions of my own presentations. I was quite a weak, as a physicist. However, my ability to explain myself in a transparent way often led to my prevalence over other participants that were much stronger than me, in terms of physics. It pleased me and depressed me at the same time. I.M. What was the weakest point of the Tournament concept, in your opinion? A.M. If I consider the Tournaments that I personally attended, I think that the greatest problem was that they convinced the participants that every problem had a predetermined solution. It might have been implicit. However, after the Finals, certain participants might have concluded that they just have seen a “best” or a “correct” “solution” of a problem. When a person, who is very successful in this method of operation with science, faces real scientific work, he might experience physiological difficulties. At first, there is no guarantee that an answer exists. At second, even if it exists, it is never known (any problem is easily solved if you know someone has solved it before.) At third, the solution of a real problem might take several years, while a large portion of these years are gaps when you cannot obtain any result. It is very uneasy if someone experiences such “failures” after he was repeatedly told that he was successful, he was winning at Olympiads and Tournaments and he should go into science. But in reality, the reason for such problems is not a “bad luck” or a “lack of skills”, but simply wrong expectations of what a real science is. I may be flawed with these assumptions, however . I.M. I cordially thank you on behalf of everybody who is interested in the history of IYPTs. Your personal memories and skeptical analysis are very important for today’s activists and organizers of the Young Physicists’ Tournaments. A.M. Thank you for your questions. Of course, I don’t remember every detail and my answers are evidently not complete. I hope that one day I could also get access to several documents that might remain in Odessa. I very hope that in result I could help you. Alexander Morozov was born in 1976. As a student at the Richelieu Lyceum (Odessa), he took part in several national and regional Young Physicists’ Tournaments, at the 5th IYPT (1992) and at the 6th IYPT (1993), where his team was a silver winner. After graduating in 1995 from Odessa University (Ukraine) and receiving his Master’s degree from the same university in 1997, he researched into soft condensed matter physics and taught undergraduate courses in the University of Groningen (Netherlands). In 2002, he defended his PhD thesis “Orientational Transitions in Block Copolymer Melts Under Shear Flow” in the group of Hans Fraaije. He worked as a postdoc at the University of Leiden on pattern formation and flow instabilities of polymer melts, discovering a so-called “subcritical transition” in Couette and Poiseuille flows, when the flow is linearly stable but non-linearly unstable. In January 2007, Alexander moved to the group of Mike Cates at the Universityof Edinburgh (United Kingdom) winning the fellowship from the Royal Society of Edinburgh. Alexander Morozov has co-authored over 20 journal articles. His main research interests include hydrodynamic instabilities and transition to turbulence in visco-elastic fluids, shear-induced phase transitions in block-copolymers, flows of dense granular matter, vesicles adsorption and also the Theory of Quartz Crystal Microbalance (QCM). The interview was primarily taken between January 28 and February 3, 2008.